Image caption Chief Constable Michael Barton said Police Scotland's complaints staff should be "put into a sack and shaken up"
A top police chief has slammed "ineptitude" at Police Scotland which "prevented" him from carrying out a full-scale misconduct probe. Durham Constabulary was called in after Scottish officers were found to have obtained communications data without judicial permission during an inquiry. But Michael Barton said came up against a "culture of secrecy" in the force. The chief constable said he wanted "everybody put into a sack and shaken up and told, for heaven's sake fix it". Police Scotland said a full investigation had eventually been carried out, adding that there had been "significant organisational learning" from the case. Seven Police Scotland officers from the counter corruption unit (CCU) were cleared of misconduct in January following a lengthy investigation involving several police forces. Officers were found to have obtained communications data without judicial permission while trying to identify a journalist's sources, after information about the Emma Caldwell murder inquiry was leaked. But while a watchdog said the failures "could properly be viewed as reckless", senior officers maintained throughout that it had been an issue of "misjudgement" by an officer "misinterpreting" a newly-introduced code. The English force subsequently recommended a full misconduct probe, which was carried out by the Police Service of Northern Ireland - and resulted in all seven officers being cleared. However, the chief constable said there "isn't any conspiracy in Police Scotland", rather putting the problems down to "ineptitude". He added: "Individually, there are smashing people in Police Scotland. Everyone we met, smashing people. "I got dreadfully cross with the legal people and the professional standards department people because I think they misinterpreted the rules, frankly, and I think they're too risk averse, but they're still smashing people. But it's the culture. Dep Ch Con Rose Fitzpatrick said: "A full misconduct investigation was carried out by PSNI at our request, which is the element of the process that Chief Constable Barton says he was prevented from undertaking. Opposition parties at Holyrood were critical of Police Scotland in the wake of the committee session. 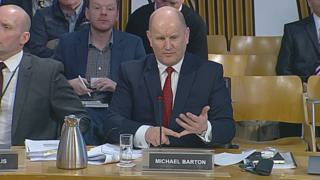 Scottish Conservative MSP Margaret Mitchell, who is also convener of the justice committee, said the evidence given by Mr Barton was "nothing worse than a desperately worrying catalogue of confusion and obfuscation at the heart of Police Scotland". Labour's justice spokesman Daniel Johnson said the "dysfunctional culture at the top of Police Scotland has been utterly exposed", saying there had been "sheer ineptitude and incompetence" over the inquiry. Lib Dem MSP Liam McArthur said Police Scotland would have "some extremely serious questions to answer when they appear before the committee next month".